Even as the Tigers open up a lead in the sorry American League Central, the elephant in the room continues to be their bullpen, especially closer. The wheels, not unexpectedly, have started to come off Jose Valverde at closer. Although he experienced some early success upon his return to the major leagues, it's proving to be fleeting. His last few outings haven't been as effective (except for a 1-2-3 save vs. Tampa Bay on Thursday). There is little doubt the Tigers' will attempt to address the closer issue as the trade deadline approaches. Don't be surprised if they look toward Milwaukee and Francisco Rodriguez. I watched his most recent save vs. Philadelphia on June 8. He was at 91 and 92 mph with his fastball - about the same as Valverde. The difference is command. He is throwing it exactly where he wants it and does appear to have two different type of fastballs. A couple looked like two seamers to left-handed hitters. His biggest edge is his slider. It has a lot of bite to it. Valverde relies on a split-finger pitch that is tumbling, not fooling anybody and is subsequently getting hammered. Ironically, K-Rod has the same agent as Valverde (Scott Boras) and signed a similar deal with the Brewers this season Valverde did with the Tigers. K-Rod was mostly ineffective last season and had to pitch his way back to the major leagues on a minor league contract this season. Like Valverde, he had 30 days to prove himself. K-Rod could make $2 million with incentives this year. It's a one-year deal. At 31, he is younger and than Valverde and may have a little more left in the tank. He also has a better career track record. 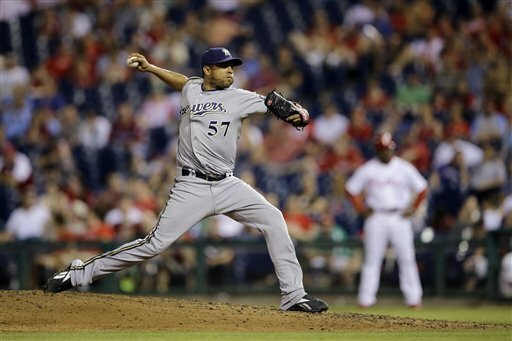 Henderson was doing an outstanding job as the Brewers' closer before he pulled a hamstring. He has returned from the D.L. s at this point (he, reportedly, was nearly sent to the minors earlier this season). Of course, there is the Boras' connection. Don't the Tigers always bite on that one? And it has paid off in the past. The Brewers are 15 games off the lead in the National League Central. They are 11 games behind in the wild card race. There is little question, already, they will be sellers at the trade deadline. The primary piece they could be looking to move is K-Rod. At minimum, he would help the Tigers' bullpen overall. At best, he could be the closer they are seeking. The question, as always, is the price. Overall, the Tigers' bullpen, which has compiled a 4-11 record, is eighth in the American League in ERA (3.82) and tied for seventh in WHIP 1.29. The Tigers have converted 13 of 21 save opportunities. Conversely, the Tigers' starting rotation leads the American League with a 31-16 record, a 3.48 ERA and a 1.14 WHIP. Pat, there is nothing wrong with depth. I just don't think Valverde can do day in and day out. Hopefully JV will go 8 innings tonight and JB finish it off. There will also be a team that throw in the towel and plan for next year or want to reduce payroll at the trade deadline.